Bike Walk Macon is able to make a difference in the community thanks to the support of visionary businesses and individuals. Together, we're reimagining the way our communities move and work to make it easier, safer, and more accessible for everyone to bike, walk, and use public transit. This #GivingTuesday, we want to remind you of what we do and why it matters, and invite you to show your support for these important community initiatives. THIS YEAR, WE'VE MADE STRIDES. At Bike Walk Macon, we know that infrastructure matters just as much as experience, exposure, and education. Catch up on what Bike Walk Macon has been up to in 2018 on both fronts. 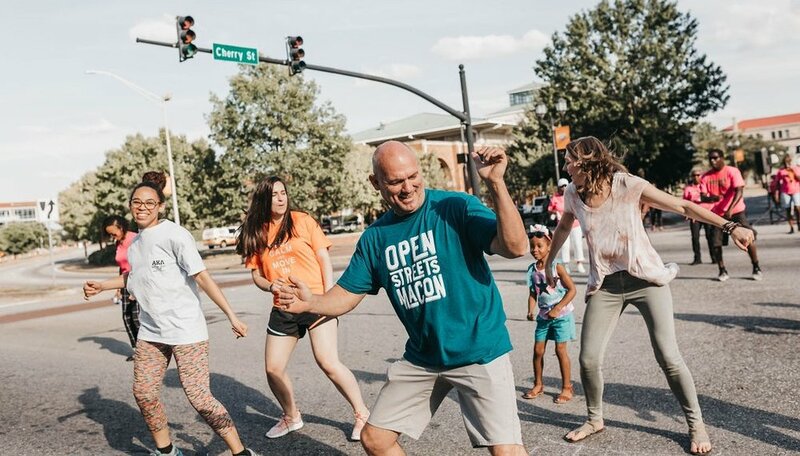 October marked the third consecutive year of Open Streets Macon, an initiative modeled after the nationwide program that shuts down miles of streets to cars for an afternoon and opens them to the public. Some highlights from this year included free exercise classes and performances on the hour, a Pokemon Go partnership with Niantic Fellow Joey Allen, and multiple first-time activity partners. Re-imagining our public spaces and transportation is the name of the game, and more than a thousand individuals from all over Macon and Middle Georgia got to experience how enjoyable and beneficial it can be. New this year, Macon Bike Party is a free, slow-paced community ride through Macon for all ages and abilities. It's modeled after SlowRoll in Detroit and aims to familiarize and encourage people to bike on Macon's streets. If you haven’t been able to join us at a Macon Bike Party yet, check out our blog post on what you’ve missed and what you can expect from our next rides. This has been a good year for bike lanes, and we can't wait to do more! In late spring, bike lanes were added to Walnut St. and Roff Ave. In addition, Bike Walk Macon received Downtown Challenge awards to build five miles of pilot bike lanes, as well as connect College Hill to downtown via Columbus St. with traffic calming additions. Those additions include a traffic circle, sharrows, lighting, repair stand, and bike rack. Stay tuned for volunteer opportunities to help us with the new bike lanes. 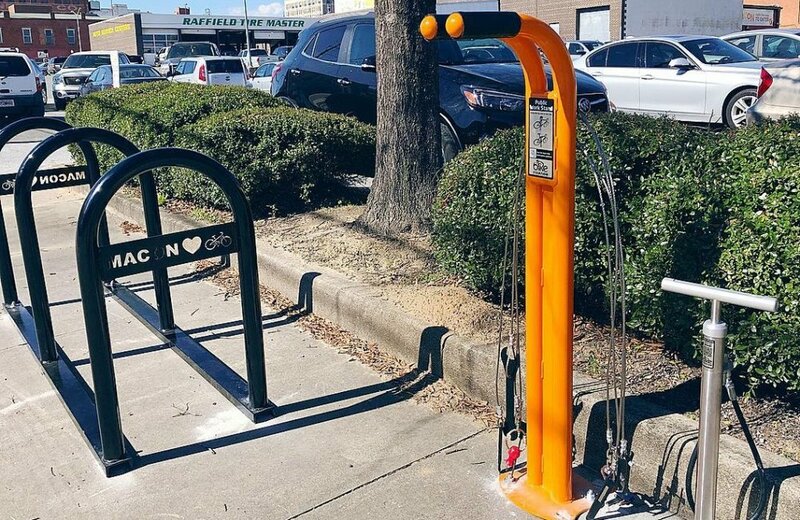 Last spring, Bike Walk Macon installed two new bike racks and one public repair stand outside of our office on Poplar St and outside of Travis Jean on Cherry Street. These stands facilitate and encourage biking in and around downtown, as well as create a visually friendly presence for alternative transportation options. Macon can seem like a daunting place to ride a bicycle for a new bicyclist or a newcomer to the city, but it shouldn’t be. This map helps bicyclists find and plan their route by marking bike lanes, trails, public repair stands, bike racks, and more! The map is a living document, meaning that it is continuously updated to reflect new additions and user comments. The need for transportation options affects us all. During our conversations at On The Table, we heard the stories of people with disabilities, a social worker whose clients can’t get to work or job training opportunities, and recreational cyclists alike. “That cyclist is a human being; those bus riders are people. They’re not some subset of humanity,” said Alex Morrison, Bike Walk Macon board member. "The first time I commuted by bike, I was more present than I've ever been before. I didn't impatiently check the clock, or flip through radio stations, or look at screens. For fifteen minutes, I just took it in and biked." Similarly, walking and doing activities like yoga at our Open Streets events have physical and mental health benefits. As one community member mused, “It’s just an entirely different world at fifteen miles an hour.” From the roads to the buildings to the people, we couldn't agree more. This #GivingTuesday, there are lots of ways you can help spread the message and be a part of the movement! You can be a part of this movement by making a donation today. Help us improve and enhance mobility in Macon and consider making a contribution to benefit infrastructure and education initiatives. Is writing and reflecting more your style? Giving Tuesday hosts a short essay competition each year. Anyone can enter, and prizes benefit your non-profit of choice. Find details. Word-of-mouth is powerful! Help us reach more people by inviting your friends to learn about what we do, participate in our programs, and follow our outlets for updates. Check out our website, find us on Facebook, and follow our Instagram account. want to support the movement? click here to donate.